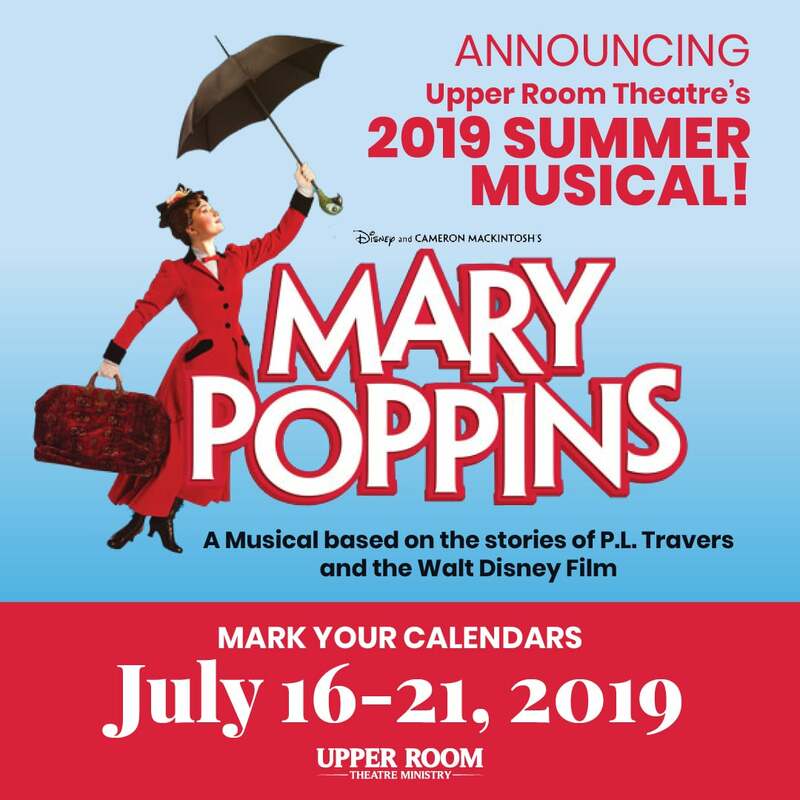 Announcing…Upper Room Theatre’s 18th anniversary musical…Mary Poppins! One of the most popular movies of all time is capturing hearts in a whole new way…as a “practically perfect” Broadway musical! Placing families in the spotlight, you’ll be inspired by the journey of Mr. Banks as he refocuses his attention from neglecting his family with material aims to recommitting to quality time with his loved ones. Plus, you’ll have a “jolly holiday” as Jane & Michael learn valuable life lessons from their unconventional nanny and the lovable jack-of-all trades Bert. Disney and Cameron Mackintosh’s Mary Poppins delighted Broadway audiences for over 2,500 performances and received nominations for nine Olivier and seven Tony Awards, including Best Musical. But don’t worry if you missed it in New York, because we’re bringing Broadway to Manassas for you next summer! The cornerstone of Upper Room Theatre Ministry is our large summer musical. Started in 2002, our award-winning summer musicals have been playing to sold-out audiences for years. Our jam-packed Winter Cabaret performances include a Broadway musical revue, our one-act play, a comedy improv troupe, table-side food & drink service and more! Produced as part of our Winter Cabaret and performed in regional competitions, our yearly one-act plays have won many awards! Upper Room Theatre Ministry is produced as part of the larger All Saints Youth Ministry Program, with a wide range of activities for teens and young adults. © 2019 Upper Room Theatre Ministry. All Rights Reserved.